The Listener editorial says there should be no more lives put at risk in the Pike River mine. It was a further disgrace that New Zealand First and Labour chose to politicise the tragedy at the last election, with Winston Peters promising to be one of the first to re-enter the mine. His swagger implied that cowardice, not caution, was the problem. Never fear, Peters would go where Mines Rescue had not been allowed to tread. This determination to re-enter the mine flies in the face of the only positive development to have come out of the disaster – a new zeal for health and safety. To unnecessarily risk more lives in the same mine, however much some of the families want it to happen, undermines the very principle this tragedy so firmly established: that safety is paramount. The $36 million cost of re-entry would not be worth mentioning, even to those who think the money could be better spent on reducing the rising road toll or child poverty, if the chances were higher that it will serve any purpose except political triumphalism. Little has spoken of “knowing when to call it quits”. Arguably, and regrettably, that point has probably passed. There must be no more lives put at risk. Just as in 2013, they don’t propose to go further than the point where the tunnel has collapsed about 2km in. The only difference is that five years ago this plan was reportedly estimated to cost $7.2 million. Last week we were told it will cost $36m. This is madness. . . But it’s not just the dollar cost, it’s the potential cost in more lives that really matters. “Safety is paramount,” they all say. If you listened closely last week, they’re not definitely going further than a second chamber, a trifling 170m into the 2km tunnel. Beyond that, they say, it might not be safe. In other words, nothing has changed but the bill. The company, successive governments, the union and even workers themselves who didn’t act on justifiable fears about safety, are to a greater and lesser extent culpable. The only good thing to have come out of this disaster is much stricter legislation that makes everyone involved responsible for health and safety. Even without that, to risk further lives for the very, very slight hope there will be evidence that could be used, or bodies to be returned, can not be justified. Pike River Recovery Agency has spent $2.5 million in its first financial year, including nine staff paid more than $100,000 a year. And its boss warns that re-entering the West Coast coal mine, the site of a 2010 explosion that cost 29 lives, might cost millions of dollars more than its original $23 million budget, as the complexities of the operation become apparent. . .
And what of the human cost, not just for the families who always feature in the news, the ones who want the mine re-entered; what of the other families who don’t? My son died in the PIke River mine accident and I couldn’t agree more with the views of Heather Levack (Letter July 28). Not all the 29 families seek recovery of any remains. I am vehemently opposed to it for many reasons, cost being one of them. My understanding is the $23 million budget quoted is for only for re-entering the drift and not the actual mine where it is presumed any remains are. Millions of dollars have already been spent. Any more should go on the living – perhaps on health services in Westland and elsewhere, or on education or on low-cost housing. I was disgusted but not surprised when Pike River was used for politically before the last election, the present situation being the outcome . Lack of sensitivity and compassion is distressing to most who are affected by these tragedies. . . 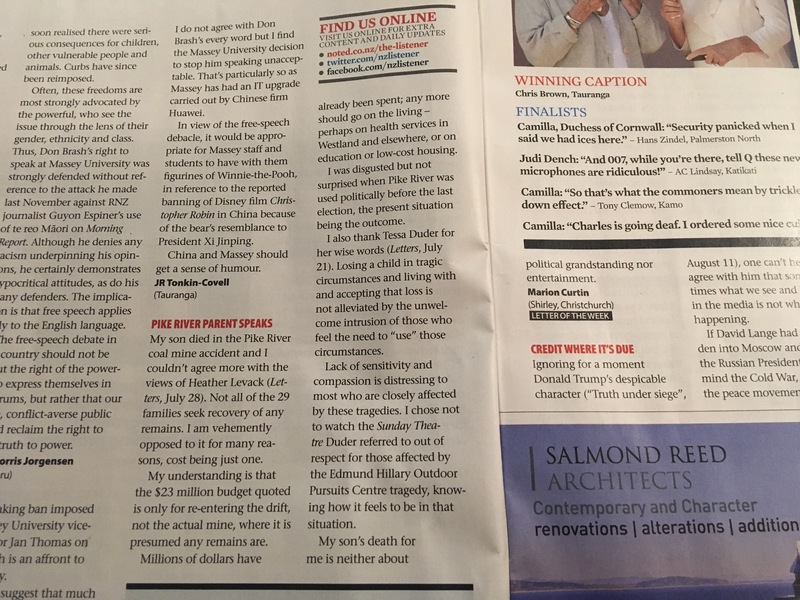 Losing a child in tragic circumstances and living with and accepting that loss is not alleviated by the unwelcome intrusion of those who wish to ‘use’ those circumstances . . My son’s death for me is neither about political grandstanding nor entertainment – Marion Curtin. When it got really bad, Marion Curtin would turn on Concert FM. Any sort of music worked, really, but Curtin was a devout Radio New Zealand listener, so the public broadcaster was her first choice. It wasn’t the music she was interested in so much, though. Over on RNZ National the words ‘Pike River’ could be uttered at any moment. On Concert FM, you only needed to avoid the news bulletins. Curtin, from Christchurch, has spent almost eight years in quiet opposition to what the public could be forgiven for mistaking was the united front of the Pike River families. For most of that time, a group of victims’ family members have fought for accountability over the tragedy and lobbied governments to re-enter the mine to recover the bodies of the 29 who died there, including Curtin’s son, Richard Holling​. Their efforts have commanded considerable media coverage. This month, stories have focused on the efforts of experts in reviewing options for possible re-entry into the mine drift. It’s not hard to find stories in favour of re-entry. The Listener letter, this story, and a long ago email read on breakfast TV are the only ones I’d come across before this which give the view of the other parents, those who oppose the idea of attempting re-entry. Curtin finds the idea abhorrent. Mostly, Curtin has kept her counsel on this. Occasionally she has spoken to the media, or written letters to the editor of the Press . But maintaining a public opposition to a prevailing view isn’t easy. Curtin has been resolute throughout that the explosion was an accident and retribution against Pike River bosses was pointless. As soon as the re-entry question was raised, she was against that too. Though she received some “positive” feedback when she did speak publicly, she isn’t in contact with any other like-minded bereaved families. Her two daughters and wider family share her view. . . It was some comfort after the deaths of our two sons to know that no-one was at fault. Those grieving the loss of the men killed in Pike River don’t have that comfort and the strong wish of some of them to find answers is understandable. But at what cost and not just in dollar terms? The re-entry has been politicised by Labour and New Zealand First which is despicable. Would they have done so if media coverage had made it clear that the campaign for re-entry was not supported by all the families? Would knowing that the on-going publicity makes matters worse for some of the families have influenced public opinion? Would that in turn have stopped the politicalisation of the tragedy? All the re-entry planning has done is prolong the agony for all the families – those wanting to let their dead be and those wanting to find answers. But what if someone gets up the drift and finds nothing? Will the pressure then be to enter the mine itself? What if someone dies in the attempt? The living should never be put at risk to recover the dead. Had there been more balanced coverage, the public support of the agitating families would have been more muted and that might, just might, have stopped the politically motivated and misguided support for a re-entry attempt. Each time I read or hear reports about Pike River families agitating for a retrieval of the bodies of the men who were killed there I wonder about the other families. You’d not know it from most reports, but some of the bereaved families have accepted that their men are dead and the mine where they died will be their grave. How hard it must be for them to get on with their lives when time and time again the disaster and the ongoing saga of re-entry hit the headlines. The latest news is that the liability for anything that goes wrong in a re-entry will like with the Pike River chief executive, not the Minister for Pike River, Andrew Little. Documents on the Pike River Recovery Agency show that while the Minister will decide whether a re-entry goes ahead, it will be the agency’s chief executive who will be liable if any re-entry goes wrong, National Party Workplace Relations Spokesperson Amy Adams says. “This Government has continued to make entering Pike River a political decision but this is patently wrong. While there’s been lots of talk about how Mr Little will be responsible for his decisions, it will be some poor senior public servant who carries the can. Sensible or not, a CE would have to resign rather than carry out a directive in the knowledge he or she was putting lives at risk. Ms Adams says the Coalition went against official advice which was to make the final decision-maker independent of politicians. The one good thing to come out of the disaster was the strengthening of health and safety laws. It would be a travesty if they were to be breached by order of a politician. Ms Adams also notes that the mission of the agency has changed from the Government’s pre-election commitments. The families’ quest for answers is understandable but that quest can’t risk more lives. Little will have to judge what level of risk is acceptable. The answer to that question has been staring Labour in the face. The answer is none. It is both morally reprehensible and incomprehensibly stupid to place another human being in an environment where death and injury have already proved to be beyond human control. Rather than humming the Red Flag in solidarity with the miners’ families, Little should be engaged in quiet persuasion that their wish to be reunited with their loved ones risks others’ loved ones suffering the same fate. At most —and purely to save everyone’s face — a recovery team might be permitted to go part way up the drift. For his own and Labour’s sake, the minister responsible for Pike River Re-entry needs to become the minister for No Re-Entry to Pike River, if not in name then most definitely in actions. It is his job to gently puncture the over-inflated hopes of the families. He needs to get the families to take ownership of the reality that re-entry cannot be a happening thing. He needs to lull them into believing they made the decision —not him nor a faceless bureaucrat chosen to run the Pike River Recovery Agency. Executing what would be the Mother of All U-turns will require some very deft politics on Little’s part. Thursday’s Supreme Court’s ruling that WorkSafe’s decision to withdraw its prosecution of Pike River mine boss Peter Whittall, in exchange for payments to the victims’ families, was unlawful provides an unexpected opportunity for everyone to come to their senses. The families should rejoice in at last receiving the justice so long denied them. They should view it as a cue to drop their demand for re-entry. That won’t happen. The families are victims alright. They are victims of politicians who have exploited their emotions without caring one jot for the consequences. There can be no sympathy for Little even if he has deluded himself into believing he is doing the right thing by the families. . . The right thing by all the families is to accept, as some of them have, that the risks of re-entry are too high. A former union head, in what’s supposed to be the workers’ party should know that safety is paramount and each new announcement is a move in that direction. Each new announcement from the government is a step away from the original irresponsible rhetoric of unconditional re-entry. Each new announcement includes ifs, buts and acknowledgements that safety must come first. The honourable and sensible course of action now would be to admit that no-one can guarantee that re-entry would be safe and in doing so to help those families still stuck in the early stages of grief to accept, as the others have, that the mine where their men died is their grave. When my first son died we waited months for the post mortem results. He’d been dead for longer than he’d lived when they finally arrived and they were somewhat of an anti-climax. That was partly because we’d hoped the post-mortem might uncover some clues to the condition which killed him that the numerous tests during his life had not and it didn’t. But it was also because it made me realise that regardless of what the report said, he was still dead and nothing could make that better. The death of a baby as a result of illness for which no-one was to blame, is different in many ways from deaths in an unsafe workplace for which someone should have, but has not, been held responsible. But no matter how it happens, death is death and it only compounds the loss if those who survive are stuck, focusing on what they’ve lost and in doing so losing what they’ve got. Continuing to pretend that a re-entry would be possible is continuing to perpetuate a lie and it’s helping to keep some of the families stuck. For their sakes and the sakes of the other fmailies who are no longer stuck, the government needs to be honest, stop wasting money and prolonging the inevitable announcement that any risk of life is too high. When politicians make promises do you take them at their word? Under MMP that’s harder because they can always use the excuse, that was their policy but had to let it go during coalition negotiations. But if it was a promise made by the two parties in government and their coalition partner outside government that one can’t be used. In August, leaders of Labour, United Future, the Maori Party and the Green Party signed a commitment to reenter Pike River mine. Environment Minister Nick Smith responded to the commitment and said the parties were either making empty promises to the families or proposing to water down a law intended to prevent future workplace tragedies. “It is a hollow political stunt for parties to promise manned re-entry of the mine by the end of 2018,” he said. “It would be reckless for politicians to override the 800-page detailed assessment that concluded that manned entry deep into this drift was too risky to life. “There is no cover-up. There is no conspiracy. Pike River was a horrible industrial accident that unnecessarily killed 29 men. Winston Peters said he’d be one of the first to go back into Pike River and manned entry was one of New Zealand First’s bottom lines. Such promises are oh so easy in opposition, but what happens when the reality of government bites? Pike River Mine minister Andrew Little says he cannot guarantee a re-entry of the mine and has told family members that he will do what he can but safety is the top priority. . . He did not intend to legislate for any exemption to the health and safety laws or immunity from liability for the Pike River Agency. Safety was the priority of the previous government in the face of harsh criticism from the Pike River families and then-opposition parties supporting them. That was the right position. The Pike River disaster was a tragedy. There are many unanswered questions on how it happened and the shortcoming that led to it happening. Some of the answers to those questions might be found if it was possible to safely reenter the mine. But safely is and must always be the operative word. The bottom line that National and the mine owners stuck to still stands: no lives must be endangered, no lives must be lost, to retrieve the dead. Some families have accepted this. Some have not and put their faith in the politicians who promised them manned entry would be undertaken. Little will be criticised for his safety-first stance, but this time it’s the right one. The wrong one was making a promise that he and the other politicians, including his leader, Jacinda Ardern, should never have made. Those politicians were mining personal grief for political ends. Pike River families are hailing today as a “moral victory” after MPs from four parties pledged to act immediately to re-enter the West Coast mine if in government. Environment Minister Nick Smith calls it a political stunt that doesn’t change the risks. . . Prime Minister Bill English gave a commitment to the Pike River families earlier this year that the Government would see through safe, unmanned entry to the area of the drift that had not been accessed. Employment law was changed because of the Pike River disaster. Under that law no-one in Solid Energy could countenance anyone entering the mine and changing the law to allow it would be a travesty. The pledge is an immoral victory and the undertaking by the MPs is irresponsible. All it does is give false hope to the bereaved. No lives should be risked to bring out whatever remains of the men who died in the mine. It’s been nearly four years since the Pike River mine disaster. Solid Energy’s decision to not re-enter the mine will have disappointed some family members, but the company could not risk more lives. The father of one of the Pike River Mine explosion victims says Solid Energy’s decision to stay out of the ruined mine will finally let his family move on. Solid Energy board chairwoman Pip Dunphy said today “potentially fatal risk factors” made the mine too dangerous to re-enter. Geraldine couple Rod and Christine Holling lost their 41-year-old son, Richard, as a result of an explosion at the West Coast mine on November 19, 2010. The Hollings have expressed their wish for Richard’s remains to be left untouched in the mine, saying that knowing where his remains were allowed them “closure”. Other families of miners killed in the mine issued a joint statement today expressing disappointment with the state-owned mining company’s decision not to recover the miners’ remains, but Rod Holling said the announcement was “good news”. Holling was sceptical of former UK mining inspector Bob Stevenson’s claims the mine could be safely entered. He also believed mining companies would learn lessons about health, safety and mine construction from the disaster. . .
Learning and acting on the lessons could save other lives, and not just in mining. Rebecca Macfie’s book on the disaster has lessons for every business. Families of the Pike River Mine victims met this morning with mine owner Solid Energy and Prime Minister John Key, only to be told the plan to re-enter the mine tunnel would not go ahead. Their faces were strained and tears were visible after leaving the meeting, even though they had gone in almost certain the news would be bad. Bernie Monk, whose son Michael died in the mine, said he would continue to investigate “to a certain degree” but acknowledged the fight might be over. “I’ve got to start asking myself, do I want to go through another three or four years of agony.” . . . I hope the answer to that question is no. Prime Minister John Key has said the taxpayer would fund a civil case against parties involved in the disaster it Crown Law thinks it could succeed. That would help the families and friends who are, justifiably, angry that no-one has been charged over the actions which led to the disaster. Whether or not that happens, the decision not to re-enter the mine means it is time to let the 29 victims rest where they died, difficult as that might be for those who loved them. Today marks the second anniversary of the explosion in the Pike River mine which led to the death of 29 men. Some of those who lost family and friends will have grieved, accepted their loss and started new lives. Some are still locked in grief and anger and focussed on what may well be the hopeless task of retrieving the remains of the dead. Today all will be remembering the men who died, thinking of what they lost and what might have been. It is still so new & all we see is the empty space, but that is not how it is in the landscape of the heart. There, there is no empty space & he still laughs & grapples with ideas & plans & nods wisely with each of us in turn. We are proud to have known him. We are proud to have called him friend. – Landscape of the Heart by Brian Andreas at Story People.